DOCSIS 3.0 8-Channel Bonding for 8 times the speed of DOCSIS 2.0. Gigabit Ethernet port for a high-speed plug-in connection. Connects fast with just 3 connections - power, cable, and Ethernet. 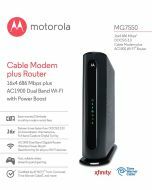 Fast activation for Comcast XFINITY, Time Warner Cable, and other popular service providers. 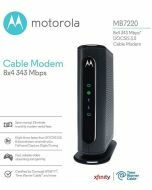 Attractive modem fits where you want it. (2" wide by 4 7/8" deep by 6" tall). Plug easily into a router, for shared high-speed Internet access by all your Wi-Fi or Ethernet capable devices. Provides high-speed connection to computers, HDTVs, and other Ethernet devices.